‘Fire and Ice’ arrives at the author’s house. I have received my copies of ‘Fire and Ice’, my book about the scorched earth destruction of northern Norway, and what a fine job The History Press have made of it. The cover is particularly striking with flames leaping out of the building in Hammerfest, a picture taken by a German soldier at the time of the burning in 1944. Now comes the job of sending copies I promised to contributors and there are quite a few – but what stories they tell! Leafing through the book I’m amazed at what we have achieved together.. and of course very proud. I have an eye on what’s happening in northern Norway, especially in this week leading up to the anniversary of the liberation of Kirkenes and Finnmark and it’s nice that there’s a two-way flow of information. I would have liked to go up for the ceremony but this may have to wait now for the better weather. I’m delighted to hear that the King of Norway, King Harald, is going to make the trip north for the anniversary. I’m pleased to hear this because I know how important that recognition of what happened in the north is to people living there, like Kare Tannvik who opened up the Andersgrotta cave to the public, into which hundreds of Kirkenes people crammed during the war to escape the bombing of the town. When I interviewed him, Kare was particularly keen to stress the contribution the partisans in the north made to the war effort, spotting and reporting back details of German sea convoys which the Russians could then attack. He feels – and he’s certainly far from alone in feeling this – that the experiences in the north during the war have been marginalised and even ignored. I hope the King has some generous words for the citizens of the north this weekend. Another person to have met the King and interviewed him was film and documentary maker Knut Erik Jensen whose series about the burning ‘Finnmark: between East and West’ won him great acclaim. The King considered the scorched earth burning the worst thing to happen to Norway since the Black Death, he told me. I have used that quote in the book, and Kare’s stories too, so I decided I should send the King a copy of the book. It’s a collection of stories from his citizens, so he should know what they are saying. I parcelled the book up in a padded envelope and headed to my local Post Office. The assistance behind the counter asked me if I’d like proof of postage. I said I would, and she started to write down the address. ‘His Majesty the King of Norway, the Royal Palace, Oslo…?’ she said, looking at me quizzically. She paused in her writing. “Do you know him?” she asked. I thanked her and went on my way. The King should have the book by Tuesday, and the chapter about Kirkenes is at the very start of the book. 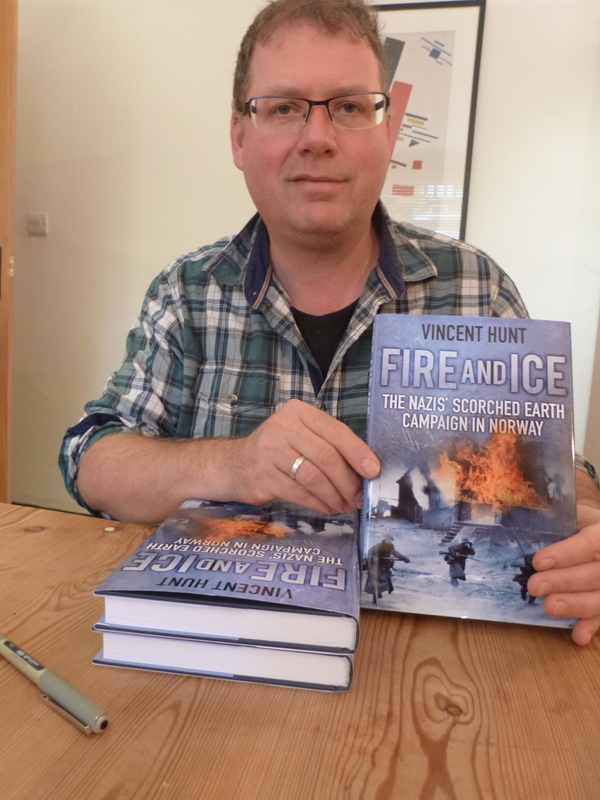 I’m not sure I put him in the index though…..
‘Fire and Ice: the Nazis’ scorched earth campaign in Norway’ by Vincent Hunt is published this week by The History Press, an account of the destruction of Finnmark through the stories of Norwegians who lived through it or with its consequences. in either hardback or ebook formats. This entry was posted in 20th Century, Arctic Circle, Finnmark, Germany, Hammerfest, history, Hitler, Honningsvag, Hopseidet, Nazi, Norway, Scorched Earth, Second World War, Soviet Union and tagged 20th century history, ammunition, arctic, Finnmark reindeer hammerfest kirkenes honningsvag nordkapp norway scorched earth, German Army, Kare Tannvik, King of Norway, kirkenes scorched earth nazi 1944 tromso, Nazi, Nazi Germany, Norway, scorched earth stories nazi finnmark travel grant norway 1944 kirkenes hammerfest tromso, vincent hunt. Bookmark the permalink.